"The reason I'm telling you about this is that the only time your full name Yitzhak Rabinis encoded in the bible, the words 'assassin that will assassinate' cross your name. "That should not be ignored, because the assassinations of Anwar Sadat and both john and Robert Kennedy are also encoded in the biblein the case of Sadat with the first and last names of his killer, and the date of the murder, and the place, and how it was done. "I think you are in real danger, but that the danger can be averted." The assassination of Rabin is dramatic confirmation of the reality of the bible code, the hidden text in the old testament that reveals the future. The code was discovered by dr. Eliyahu rips, one of the world's leading experts in group theory, a field of mathematics that underlies quantum physics. It has been confirmed by famous mathematicians at Harvard, Yale, and Hebrew university. It has been replicated by a senior code-breaker at the U.S. Department of defense. It has passed three levels of secular peer review at a leading U.S. Math journal. Rabin's assassination was not the only modern event found. In addition to the Sadat and Kennedy assassinations, hundreds of other world-shaking events are also encoded in the bibleeverything from world war ii to Watergate, from the holocaust to Hiroshima, from the moon landing to the collision of a comet with Jupiter. And the Rabin assassination was not the only event found in advance. The Jupiter collision was found, with the exact date of impact, before it happened, and the dates of the gulf war were found in the bible before the war started. It doesn't make ordinary sense in our secular world, and since I am not religious, I would normally be among the first to dismiss it as millennium fever. But I have known about this for five years. I have spent many weeks with the Israeli mathematician, dr. Rips. I learned Hebrew, and checked the code on my own computer every day. I talked to the man at the defense department, who independently confirmed that the bible code does exist. And I went to Harvard and Yale and Hebrew university to meet with three of the worlds most famous mathematicians. They all confirmed that there is a code in the bible that reveals the future. I did not fully believe it until Rabin was killed. 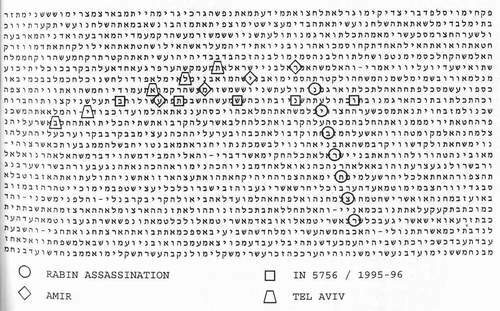 I found the bible code's prediction of his assassination myself, a clear warning that he would be killed in the Hebrew year that began in late 1995, but never really believed it would happen. When he was killed, as predicted, when predicted, my first thought was, "oh my god, it's real." It could not be a coincidence. The words "assassin that will assassinate" across the name "Yitzhak Rabin" the only time his full name appears in the old testament. The bible code stated he would be killed in the Hebrew year that started in September 1995. Now, on November 4th, he was dead. Rabin's friend, Chaim Guri, told me it was also the first thing he thought of when the prime minister was shot. "It was like a knife in my heart," said Guri. "I called the chief of staff, general Barak, and said, 'the American reporter, he knew it a year ago, I told the prime minister. It was in the bible.' "
When I first found the Rabin murder encoded, I remembered the first question my book editor had asked me: "what if you had known about the Sadat assassination before it happened? Could you have warned him, and kept it from happening?" With Rabin, I tried and failed. Before the assassination no one was able to find the name of the gunman, or the exact date. A few days after I first contacted the prime minister, dr. Rips and I met with the chief scientist at the ministry of defense, gen. Isaac ben-Israel. We searched for details. But only the year of the predicted murder was apparent. 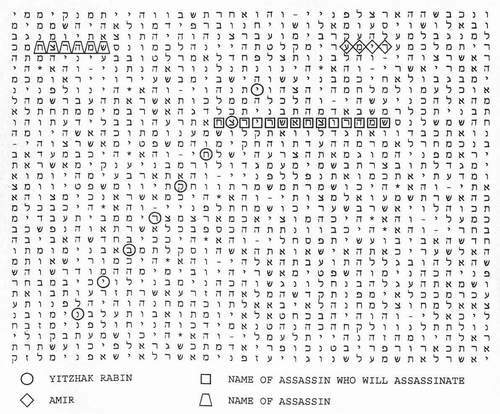 After Rabin was killed, the name of his assassin, "Amir," was immediately found in the bible code. It was always there, right above Rabin's name, but hidden in plain sight. "Amir" was encoded in the same place as "Yitzhak Rabin" and "assassin who will assassinate." Moreover, the words "name of the assassin" appeared in the plain text of the bible in the same verse that the name "Amir" appeared in the hidden text. And also, in that same verse, the hidden text stated, "he struck, he killed the prime minister." He was even identified as an Israeli who shot at close range: "his killer, one of his people, the one who got close." The code revealed when and where it would happen. "In 5756," the Hebrew year that began in September 1995, crossed both "Tel Aviv" and "Rabin assassination." "Amir" appeared again in the same place. But before Rabin was killed we knew only that the bible code predicted his murder "in 5756." And Rabin ignored the warning. "He won't believe you," his friend Guri had told me when I first gave him the letter. "He's not at all a mystic. And he is a fatalist." So, I still don't know if the assassination could have been prevented. I only know what I told the prime minister in my letter: "no one can tell you whether an event that is encoded is pre-determined, or is only a possibility. My own guess is that it is only a possibilitythat the bible encodes all the probabilities, and what we do determines the actual outcome." We had not been able to save Rabin's life. But suddenly, brutally, I had absolute proof that the bible code was real. Five years ago, when I first flew to Israel, the bible code and the bible itself were the furthest things from my mind. I was there to meet with the chief of Israeli intelligence about the future of warfare. But while I was there I learned of another mystery, one that suddenly pulled me back several millennia3200 years, to be exact, to the time when according to the bible god spoke to Moses on mount Sinai. As I was leaving intelligence headquarters, a young officer I'd met stopped me. "There's a mathematician in Jerusalem you should see," he said. "He found the exact date the gulf war would begin. In the bible." "I'm not religious," I said, getting into my car. "Neither am i," said the officer. "But he found a code in the bible with the exact date, three weeks before the war started." It all seemed beyond belief. But the man at Israeli intelligence was as secular as I was, and the man who had discovered the code was considered a near genius in the world of mathematics. I went to see him. Eli rips is a modest man. He is so self-effacing that he tends to give other people credit for his own work, and one would never guess he is a world famous mathematician. When I first met with him in June of 1992, at his home outside Jerusalem, I assumed that by the end of the evening I would know there was nothing to his claim. Rips pulled down a volume from his bookshelf, and read to me quoting an eighteenth century sage, a man called the genius of Vilna: "the rule is that all that was, is, and will be unto the end of time is included in the torah, from the first word to the last word. And not merely in a general sense, but as to the details of every species and each one individually, and details of details of everything that happened to him from the day of his birth until his end." I picked up a bible from the desk in his study, and asked rips to show me the gulf war. Instead of opening the bible, he turned on his computer. "The bible code is a computer program," he explained. 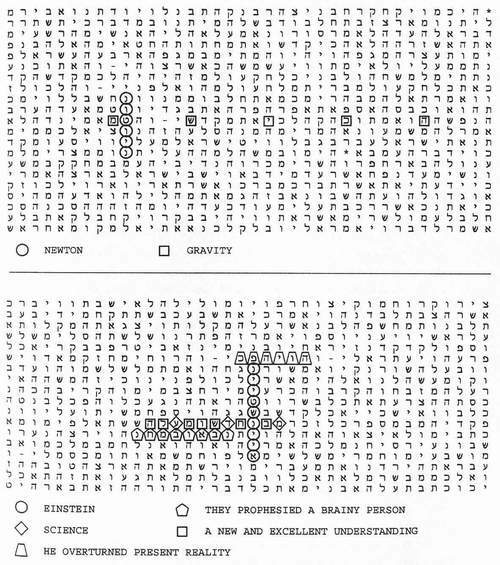 On the computer screen appeared Hebrew letters highlighted in five different colors creating a crossword puzzle pattern. Rips handed me a print-out. "Hussein," "scuds," and "Russian missile" were all encoded together in genesis. The full code sequence stated "Hussein picked a day." "Here, in genesis, chapter 14, where we have the story of Abrahams wars with the surrounding kingdoms, we found the date'fire on 3rd Shevat.' "
Rips looked up from his computer. "That's the date in the Hebrew calendar equivalent to January 18,1991," he explained. "Its the day Iraq launched the first scud missile against Israel." "How many dates did you find?" I asked. "Just this one, three weeks before the war began," he replied. "But who knew 3000 years ago that there would be a gulf war, let alone that a missile would be fired on January 18th?" The bible code was discovered in the original Hebrew version of the old testament, the bible as it was first written. That book, now translated into every language, is the foundation of all western religion. The bible code is ecumenical, the information is for everyone. But the code only exists in Hebrew, because that is the original language of the bible. Rips told me that the first hint of the encoding had been found more than 50 years ago by a rabbi in Prague, Czechoslovakia. The rabbi, H.M.D. Weissmandel, noticed that if he skipped fifty letters, and then another fifty, and then another fifty, the word "torah" was spelled out at the beginning of the book of genesis. And that the same skip sequence again spelled out the word "torah" in the book of exodus. And in the book of numbers. And in the book of Deuteronomy. "I heard about it totally by chance, talking to a rabbi in Jerusalem," said rips. "I tried to find the original book, and finally found the only copy that apparently exists, at the national library in Israel. There were only a few pages about the code, but it seemed interesting." That was twelve years ago. "At first I tried just counting letters like Weissmandel," said rips. "You know, Isaac Newton also tried to find the code in the bible, and he considered it more important than his theory of the universe." The first modern scientist, the man who figured out the mechanics of our solar system and discovered the force of gravity, sir Isaac Newton, was certain that there was a hidden code in the bible that would reveal the future. He learned Hebrew, and spent half his life trying to find it. In fact, it was for Newton, according to his biographer john Maynard Keynes, an obsession. When Keynes became provost at Cambridge university, he discovered there the papers that Newton had packed up in 1696 when he retired as provost. Keynes was shocked. Most of the million words in Newton's own handwriting were not about mathematics or astronomy, but esoteric theology. They revealed that the great physicist believed there was hidden in the bible a prophecy of human history. Newton, said Keynes, was certain the bible, indeed the whole universe, was a "cryptogram set by the almighty," and wanted to "read the riddle of the godhead, the riddle of past and future events divinely fore-ordained." Rips succeeded. The discovery that had eluded sir Isaac Newton was made by Eliyahu rips because he had the one essential tool that Newton lackeda computer. The hidden text of the bible was encoded with a kind of time-lock. It could not be opened until the computer had been invented. "When I applied a computer, I made the breakthrough," rips explained. "I found words encoded far more than statistics allowed for by random chance, and I knew I was on to something of real importance." "It was the happiest time in my life," said rips, who came to Israel from introduction reporting is the first rough take on history. This book is the first full account of a code in the bible that reveals events that took place thousands of years after the bible was written. The code was discovered by dr. Eliyahu rips, one of the world's leading experts in group theory, a field of mathematics that underlies quantum physics. It has been confirmed by famous mathematicians at Harvard, Yale, and Hebrew university. It has been replicated by a senior code-breaker at the U.S.. Department of defense. It has passed three levels of secular peer review at a leading U.S.. Math journal. It could not be a coincidence. The words "assassin that will assassinate" cross the name "Yitzhak Rabin" the only time his full name appears in the old testament. 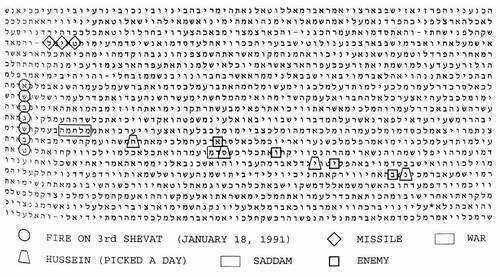 The bible code stated he would be killed in the Hebrew year that started in September 1995. Now, on November 4th, he was dead. "It was like a knife in my heart," said Guri. "I called the chief of staff, general Barak, and said, 'the American reporter, he knew it a year ago, I told the prime minister. It was in the bible.'" "Amir" was encoded in the same place as "Yitzhak Rabin" and "assassin who will assassinate." Moreover, the words "name of the assassin" appeared in the plain text of the bible in the same^ verse that the name "Amir" appeared in the hidden text. And also, in that same verse, the hidden text stated, "he struck, he killed the prime minister." "Here, in genesis, chapter 14, where we have the story of Abrahams wars with the surrounding kingdoms, we found the date'fire on 3rd Shevat.'" "It was the happiest time in my life," said rips, who came to Israel from Russia more than twenty years ago, and still speaks with an accent that is both Hebrew and Russian. Although he is religious, and in the top right corner of every page of his calculations writes two Hebrew letters thanking God, for him, like for Newton, the math is also sacred. Rips told me he had developed a sophisticated mathematical model that, when implemented by a computer program, confirmed that the Old Testament is in fact encoded. He was stalled however in making the final breakthrough, a way to prove the reality in a simple and elegant way. Then he met another Israeli, Doron Witztum. Witztum is a physicist but not connected to any university and, compared to Rips, is unknown to the world of science. But it was Witztum who completed the mathematical model, and Rips considers him "a genius like Rutherford." He handed me a copy of their original experiment, "Equidistant Letter Sequences in the Book of Genesis." The abstract on the cover page read, "Randomization analysis indicates that hidden information is woven into the text of Genesis in the form of equidistant letter sequences. The effect is significant at the level of 99.998%." I read through the paper as we sat in his living room. What Rips and his colleagues had done was to search for the names of thirty-two great sages, wise men from Biblical to modern times, to determine whether their names, and the dates of their birth and death, were encoded in the first book of the Bible. They looked for the same names and the same dates in the Hebrew translation of War and Peace and in two original Hebrew texts. In the Bible the names and the dates were encoded together. In War and Peace and the two other books, they were not. And the odds of finding the encoded information by random chance were ultimately found to be 1 in 10 million. In his final experiment, Rips took the thirty-two names and sixty-four dates and jumbled them in 10 million different combinations, so that 9,999,999 were a mismatch, and only one was a correct pairing. He then did a computer run to see which of the ten million examples got a better result-and only the correct names and dates came together in the Bible. "None of the random pairings matched," said Rips. "The results were 0 vs. 9,999,999, or one in 10 million." A senior code-breaker at the top secret National Security Agency, the clandestine U.S. government listening post near Washington, heard about the startling discovery in Israel, and decided to investigate. Harold Cans had spent his life making and breaking codes for American intelligence. He was trained as a statistician. He spoke Hebrew. And he was sure that the Bible code was "off-the-wall, ridiculous." Cans was certain he could prove that the code did not exist. He wrote his own computer program, and he looked for the same information the Israelis had found. He was surprised. It was there. The dates that the sages were born and died were encoded with their names. Cans could not believe it. He decided to look for entirely new information in the Bible code, and thereby expose the flaw in Rips' experiment, possibly even reveal a hoax. "If this was real," said Cans, "then I figured that the cities where these men were born and died ought to be encoded as well." In his 440-hour experiment Cans checked not only the names of the thirty-two sages Rips finally used, but also thirty-four others from an earlier list, checking all sixty-six against the names of the cities, and the results made him a believer. "It sent a chill up my spine," recalled Cans. The cities also matched the names of the sages in the Bible code. The Pentagon code-breaker, using his own computer program, had independently replicated the Israelis' results. Men who lived hundreds and thousands of years after the Bible was written were encoded in detail. Rips had found the dates. Cans had found the cities. The Bible code was real. "We conclude that these results provide corroboration of the results re-ported by Witztum, Rips, and Rosenberg," wrote Gans in a final report of his investigation. "In evaluating the Bible code," he later said, "I was doing the same kind of work I did at the Department of Defense." "At first, I was 100% skeptical," said the Pentagon code-breaker. "I thought this was all just silly. I set out to disprove the code, and ended up proving it." THE Bible was encoded with information about the past and about the future in a way that was mathematically beyond random chance, and found in no other text. Rips and Witztum submitted their paper to a leading American math journal, Statistical Science. The editor, Robert Kass, a professor at Carnegie-Mellon, was skeptical. But he decided to have it checked out by other experts, the peer review process standard in all serious scientific journals. To Kass' surprise, the Rips-Witztum paper passed. The first referee said the math was solid. Kass called in a second expert. He, too, said the numbers held up. Kass did something unprecedented-he called in a third expert. "Our referees were baffled," said Kass. "Their prior beliefs made them think the Book of Genesis could not possibly contain meaningful references to modern-day individuals. Yet, when the authors carried out additional checks, the effect persisted." Kass sent an E-mail message to the Israelis: "Your paper has passed the third peer review. We will publish it." Despite the automatic skepticism of secular mathematicians, no one could find fault with the math. No one could raise an unanswered question about the experiment. No one could explain away the startling fact that the Bible was encoded-that it revealed events that took place after the Bible was written. THE Bible is constructed like a giant crossword puzzle. It is encoded from beginning to end with words that connect to tell a hidden story. But it is more than a simple skip code. Criss-crossing the entire known text of the Bible, hidden under the original Hebrew of the Old Testament, is a complex network of words and phrases, a new revelation. There is a Bible beneath the Bible. The Bible is not only a book-it is also a computer program. It was first chiseled in stone and handwritten on a parchment scroll, finally printed as a book, waiting for us to catch up with it by inventing a computer. Now it can be read as it was always intended to be read. To find the code, Rips eliminated all the spaces between the words, and turned the entire original Bible into one continuous letter strand, 304,805 letters long. In doing that, he was actually restoring the Torah to what great sages say was its original form. According to legend, it was the way Moses received the Bible from God-"contiguous, without break of words." The computer searches that strand of letters for names, words, and phrases hidden by the skip code. It starts at the first letter of the Bible, and looks for every possible skip sequence-words spelled out with skips of 1, 2, 3, all the way up to several thousand. It then repeats the search starting from the second letter, and does it over and over again until it reaches the last letter of the Bible. * Start at the first letter of the above paragraph, skip every three letters, and the code is revealed: "Rips Explained that each code is a Case Of adding Every fourth or twelfth or fiftieth letter to form a word." The hidden message-"READ THE CODE." After it finds the key word, the computer can then look for related information. Time after time it finds connected names, dates, and places encoded together-Rabin, Amir, Tel Aviv, the year of his assassination, all in the same place in the Bible. 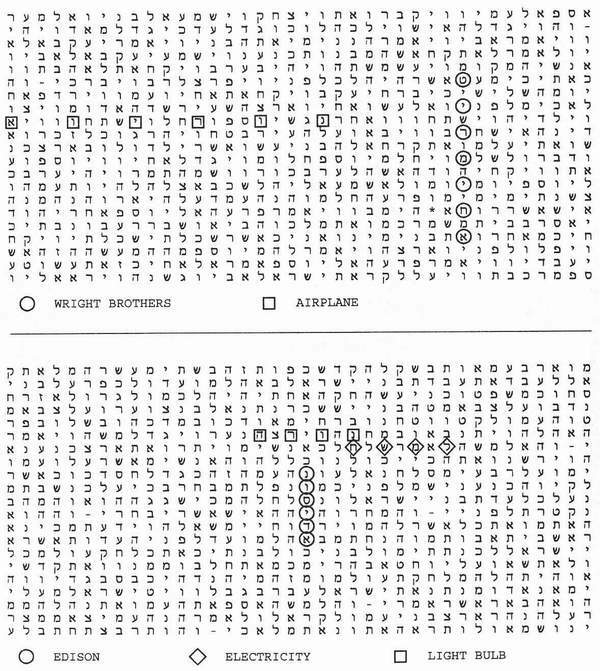 The computer scores the matches between words, using two tests-how closely they appear together, and whether the skips that spell out the search words are the shortest in the Bible. Rips explained how it works, using the Gulf War as an example. "We asked the computer to search for Saddam Hussein," he said. "Then we looked for related words to see if they came together in a way that was mathematically significant. With the Gulf War, we found Scuds with Russian missiles, and the date the war would begin encoded with the name Hussein." The words formed a crossword puzzle. Consistently, the Bible code brings together interlocking words that reveal related information. With Bill Clinton, President. With the Moon landing, spaceship and Apollo 11. With Hitler, Nazi. With Kennedy, Dallas. In experiment after experiment, the crossword puzzles were found only in the Bible. Not in War and Peace, not in any other book, and not in ten million computer-generated test cases. According to Rips, there is an infinite amount of information encoded in the Bible. Each time a new name or word or phrase is discovered in the code, a new crossword puzzle is formed. Related words cross vertically, horizontally and diagonally. We can use the Rabin assassination as a case study. First we asked the computer to search the Bible for the name "Yitzhak Rabin." It appeared only once, with a skip sequence of 4772. The computer divided the entire Bible-the whole strand of 304,805 letters-into 64 rows of 4772 letters. 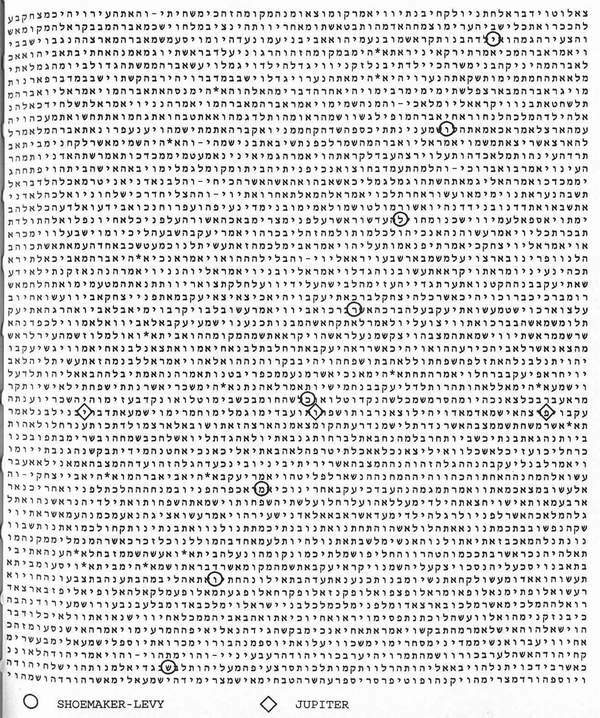 The Bible code print-out is a snapshot of the center of that matrix. 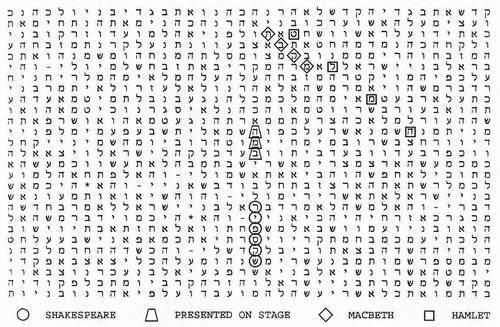 In the middle of the snapshot is the name "Yitzhak Rabin," with each letter circled. If "Yitzhak Rabin" was spelled out with a skip code of 10, then each row would instead be 10 letters long. If the skip was 100, then the rows would be 100 letters long. And each time the rows are re-arranged a new set of interlocking words and phrases is created. Each code word determines how the computer presents the text of the Bible, what crossword puzzle is formed. Three thousand years ago, the Bible was encoded so that the discovery of Rabin's name would automatically reveal related information. The odds against Rabin's full name appearing with the prediction of his assassination were at least 3000 to 1. Mathematicians say a hundred to one is beyond chance. The most rigorous test ever used is 1000 to l.
I flew to Israel to warn Rabin on September 1, 1994. But it was only after he was killed a year later, that we found the name of his assassin. "Amir" was encoded in the same place as "Yitzhak Rabin" and "assassin who will assassinate." Amies name had been there for 3000 years, waiting for us to find it. But the Bible code is not a crystal ball-you can't find anything without knowing what to look for. Clearly, this was not Nostradamus, not "A Star Will Rise in the East and a Great King Will Fall," words that can later be read to mean anything that actually does happen. Instead, there were details as precise as the story reported on CNN-the full name of Rabin, the name of his assassin, the year he was killed-all but Amir found before it happened. Still, it was hard to believe. I asked Rips if it were not possible to find similar information in any text, random letter combinations that had no actual meaning. Perhaps finding the date of the Gulf War, even the assassination of Rabin, was just a coincidence. Rips took a coin out of his pocket and flipped it in the air. "If this is a fair coin," he said, "then half of the time it should come up heads, and half of the time it should come up tails. If I flip the coin twenty times and each time it comes up heads, then everyone would assume the coin is weighted. The probability that the same side would come up twenty times in a row is less than one in a million." "The Bible is like the weighted coin," said Rips. "It is coded." He cited his original experiment, the sages encoded in Genesis. "The only other possibility is that a random event happened-that we, by chance, found the best match of thirty-two names and sixty-four dates-and that would only happen one time in 10 million." But if Rips is right, if there is a Bible code, if it foretells the future, then conventional science can't yet explain it. Not surprisingly, some conventional scientists can't accept that. One, an Australian statistician, Avraham Hasofer, attacked the Bible code before Rips published his experiment, before the mathematical evidence was known. "Certain types of patterns must inevitably occur in large data sets," he said. "You can no more find a patternless arrangement of digits or letters than you can find a cloud without a shape." "In any event," said Hasofer, "the use of a statistical test in matters of faith raises grave problems." Rips says his critic is wrong on the science, and wrong on the religion. Hasofer, he notes, never did a statistical test, never checked the math, and he never looked at the Bible code itself. "Of course you can find random letter combinations in any text," says Rips. "Of course, you will find Saddam Hussein' in any large enough data base, but you won't find `Scuds,' `Russian missiles,' and the day the war began, all in the same place, in advance. It doesn't matter if we're looking in a text of 100,000 or 100,000,000 letters, you will not find coherent information-except in the Bible. "A great part of mankind now assumes that the Bible is just old folklore, myth, that science is the only reliable picture of reality. Others say that theBible, as the word of God, must be true, and therefore science must be in error. I think that, finally, when we understand both well enough, religion and science will come together-we will have a Unified Field Theory." In the nearly three years since the Rips-Witztum paper was published, no one has submitted a rebuttal to the math journal. The major scientists who actually examined the Bible code confirm it. The Pentagon code-breaker, the three referees at the math journal, the professors at Harvard, Yale, and Hebrew University all started out skeptics, and ended up believers. EINSTEIN once said, "The distinction between past, present, and future is only an illusion, however persistent." Time, said Einstein, is not at all what it seems. It does not flow in only one direction, and the future exists simultaneously with the past. The other great physicist who defined our universe, Newton, not only said that the future already exists, but believed that it could be known in advance, and in fact himself searched for the hidden code in the Bible that would reveal it. Now some scientists, including the leading physicist in the world today, Stephen Hawking, believe that people might one day actually be able to travel in time. "Time travel," says Hawking, "might be within our capabilities in the future." Maybe the poet T. S. Eliot was right: "Time present and time past/ Are both perhaps present in time future, / And time future contained in time past." But I was not prepared to believe that the future was encoded in the Bible without the kind of evidence a reporter trusts, information that can be checked out in the real world. information I asked for encoded in the Old Testament. When we checked the control text, War and Peace, the information was not there. When we checked the Bible, it was. In that week, and in six subsequent trips to Israel, and in my own investigation over the next five years, we found ten and then one hundred and then one thousand world events encoded in the Bible. It was possible on any given day to pick up the New York Times or the Jerusalem Post, and if the story on the front page was important enough, find it encoded in a document that had been written 3000 years ago. The information, time after time, proved as accurate as the current newspaper accounts, the names, the places, the dates all encoded in Genesis through Deuteronomy. And sometimes it was found in advance. Six months before the 1992 election, the code revealed Bill Clinton's victory. Connected to "Clinton" was his future title, "President." The greatest recent upheaval in America, the fall of Richard Nixon in the Watergate crisis, is also encoded in the Bible. "Watergate" appears with "Nixon" and the year he was forced to resign, 1974. Where "Watergate" is encoded, the hidden text of the Bible asks a question: "Who is he? President, but he was kicked out." The Great Depression is encoded with the crash of the stock market. 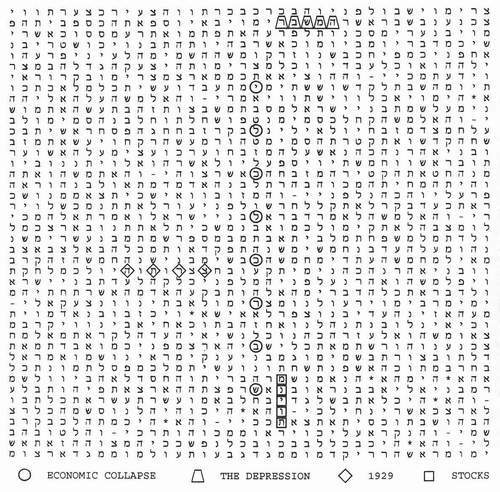 "Economic collapse" and "Depression" appear together in the Bible, with the word "Stocks." The year it all started, 1929 ("5690"), is encoded in the same place. But man's triumphs, like the Moon landing, are also encoded. "Man on Moon" appears with "spaceship" and "Apollo 11 ." Even the date Neil Armstrong first stepped on the lunar surface, July 20, 1969, is in the Bible. Armstrong's words, "One small step for a man, one giant leap for mankind," are echoed by the hidden text of the Bible. Where the date he set foot on the Moon is encoded, the words that cross "Moon" in the Bible are, "Done by mankind, done by a man." It is all encoded in Genesis with "Apollo 11," at the point where God tells Abraham, "Look now toward Heaven, and count the stars, if thou be able to number them." In the years following my first trip to Israel, I kept searching the Bible code on my own, not as a mathematician, but as an investigative reporter, checking the facts. What is subject to proof, what can be pinned down in addition to the math, is information about the recent past, and the near future. Two years into my investigation I found something cosmic predicted in the code-and then watched it happen in the real world. In July 1994, the world witnessed the biggest explosion ever seen in our solar system. A comet bombarded Jupiter with the force of more than a billion megatons, creating fireballs the size of the Earth. 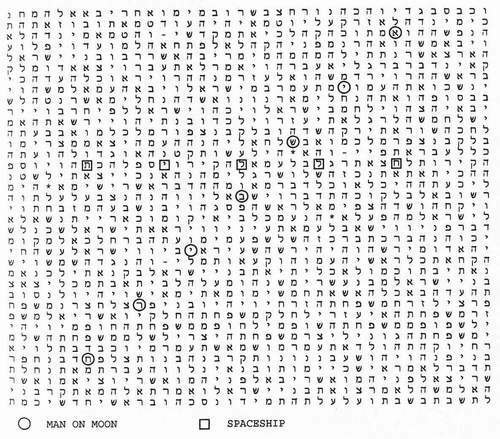 I had found the Jupiter / comet encoding in the Bible myself, two months before the collision, using a computer program written for me in Israel, based on Rips' mathematical model. The collision was encoded twice, once in the Book of Genesis and again in the Book of Isaiah. The comet, "Shoemaker-Levy," appeared both times with its full name-the names of the astronomers who discovered it in 1993 -and its impact with "Jupiter" was graphically presented. In the Bible code, the name of the planet and the name of the comet intersect twice. In Isaiah, the exact date of the impact was stated in advance, July 16. The event that astronomers were able to predict a few months ahead of time, the Bible code predicted just as precisely 3000 years before it happened. It was one of those finds that was so dramatic it caused me to believe all over again. Through two years of investigation, I kept asking myself, Could this really be true? Had some non-human intelligence actually encoded the Bible? Each morning I woke up doubting it all, despite the overwhelming evidence. Could this be a hoax? Not a new revelation, but another Hitler diary, a cosmic Clifford Irving? The rabbis and the professors have never agreed on the origins of the Bible. The religious authorities say that the first five books, Genesis through Deuteronomy, were written more than 3000 years ago by Moses. The academic authorities say they were written by many hands over many hundreds of years. The argument turns out to be irrelevant. The Old Testament has been a settled text for at least a thousand years. The Torah has not changed in that time, and no scholar would question that. There is a complete version from 1008 AD (the Leningrad codex), and every Hebrew Bible that now exists is the same letter for letter. So the text used in the computer program-the one in which I found the exact date of the collision of the comet with Jupiter, July 16, 1994-has not changed in at least a thousand years. A hoax is simply ruled out because it would have required a forger who could see the future. No forger had encoded the Jupiter collision, not in Biblical times, not in the Dark Ages, and not in the spring of 1994, two months before it happened. Once more, I felt certain. I went to see Rips at Columbia University. He was there as a visiting professor, occupying the same office in the mathematics building that was once occupied by the president of the American Mathematical Society, Lipman Bers, who organized the worldwide campaign that freed Rips from a Soviet prison twenty-six years ago. Back in the Soviet Union as a young graduate student, Rips was arrested for demonstrating against the 1968 invasion of Czechoslovakia. He spent the next two years as a political prisoner. It was only through the intercession of mathematicians in the West that Rips was ultimately freed and allowed to emigrate to Israel. Now a professor at Hebrew University in Jerusalem, Rips has also taught at the University of Chicago and Berkeley, and is respected throughout the world of mathematics. In his office at Columbia, Rips looked at my print-out of the Jupiter collision. "This is exciting," he said, like myself sometimes still awed by the precision of the Bible code. Astronomers knew the comet would hit Jupiter because they could trace its trajectory, they knew when because they could measure its speed. But whoever encoded the Bible had the same information thousands of years before that was possible, thousands of years before Shoemaker and Levy discovered the comet, so how could the Bible encode the date of the impact? It was, of course, the big question-how could the future be known? I went with Rips to see one of Harvard's top mathematicians, David Kazhdan. Kazhdan told me he believes that the Bible code is real, but he could not explain how it works. "It does appear that the Bible was encoded 3000 years ago with information about future events," said Kazhdan. "I've seen the results. There are no scientific grounds to challenge it. I think it is real." "We don't know," said Kazhdan. "But we recognized the existence of electricity a hundred years before we could explain it." I asked Rips and Kazhdan how anyone, man or God, could see what does not yet exist. I had always assumed that the future does not exist until it happens. Rips replied first with a theological answer. "The world was created," he said. "The Creator is not confined by time or space. For us the future is non-existent. For the Creator, the whole universe from beginning to end was seen in one stroke." Kazhdan gave a Newtonian explanation. "Science accepts that if we know the position of every molecule and atom, we can foresee everything," he said. "In the mechanical world, if we know the position and velocity of an object-a bullet or a rocket to Mars-then we could also know precisely when and where it will arrive. So there's no problem in that sense about knowing the future." "But if you ask me if I am surprised that the future is encoded in the Bible," added Kazhdan, "of course I am." I. Piatetski-Shapiro, a leading mathematician at Yale, also confirms the Bible code, but is equally amazed by its revelation of events that took place long after the Bible was written. "I believe the code is real," said Piatetski-Shapiro. "I saw the results, and they were quite surprising. Predictions of the future, of Hitler and the Holocaust." The Israeli who works with Rips, Doron Witztum, had done an extensive search for "the Holocaust" in the Bible code, and found it spelled out in extraordinary detail. "Hitler" and "Nazi" were encoded together with "slaughter." "In Germany" was encoded with "Nazis" and "Berlin." And the man who actually ran the concentration camps, "Eichmann," was encoded with "the ovens" and "extermination." "In Auschwitz" was encoded where the plain text of the Bible decrees "an end to all flesh." Even the technical details of the "final solution" were there. The gas used to kill the Jews, "Zyklon B," was encoded with "Eichmann." Piatetski-Shapiro had seen these findings and he was startled. "As a mathematician," he said, "my instinct is that there is something real here." But the Yale professor cannot explain how it was done. "There is no way within the known laws of mathematics to explain seeing the future," he said. "Newtonian physics is too simple to explain a set of predictions this complex and detailed. Quantum physics is also not enough. What we're talking about here is some intelligence that stands outside." The mathematician paused for a moment, then spoke: "I think that is the only answer-that God exists." "Do you think one day we will be able to explain it in purely scientific terms?" I asked. "I doubt it," said Piatetski-Shapiro. "Maybe part of it, but always some part will remain unknown." "It is possible, theoretically, to believe in the Bible code without believing in God," he added. "But if you assume God exists, you don't have to answer the question, Who can see the future?" IF the future can be foreseen, can it also be changed? If we had known about Hitler in advance could we have prevented World War II? Could Rabin or Kennedy have been saved from an assassin's bullet? Even if Amir or Oswald had been found in the Bible code in advance, could they have been stopped? Was there an alternative probability-that the gunmen would be caught, that Rabin or Kennedy would live? The question is whether the Bible code tells us what will happen or may happen, presents one pre-determined future, or predicts all the possible futures. Physicists have been locked in the same debate ever since Werner Heisenberg formulated his famous Uncertainty Principle. Stephen Hawking defined it in layman's terms: "One certainly cannot predict future events exactly if one cannot even measure the present state of the universe exactly!" Most scientists believe that the Uncertainty Principle is a fundamental, inescapable property of the world. And it states that there is not one future, but many possible futures. Hawking put it this way: "Quantum mechanics does not predict a single definite result for an observation. Instead, it predicts a number of different possible outcomes, and tells us how likely each of these is." Does the Bible code, like quantum physics, present all the probabilities? Or, are the encoded predictions set in stone? Some, like the Rabin assassination, clearly do happen. Did all the predictions come true? We don't yet have enough experience with the Bible code to know, but even the apparently iron-clad rule of the Uncertainty Principle might not apply to the code. In the end, all conventional science, indeed all conventional concepts of reality, may be irrelevant. If some being that stands outside the system, outside our three dimensions, outside of time, encoded the Bible, the code may not obey any of our laws, scientific or otherwise. Even Hawking admits that the rules of chance may not apply to God: "We could still imagine that there is a set of laws that determines events completely for some supernatural being." Once we admit that we are not alone-that there is some intelligence beyond our own-everything else must be re-examined. And the greatest scientist of our time, Einstein, never accepted that the universe was governed by chance. "God," said Einstein, "does not play dice." CAN there really be a code in the Bible that recorded events thousands of years before they happened, that told our history ahead of time, that might now reveal a future that for us does not yet exist? I went to see Israel's most famous mathematician, Robert J. Aumann. He is one of the world's experts in game theory, and a member of both the Israeli and the U.S. National Academy of Science. "The Bible code is simply a fact," said Aumann. "The science is impeccable," he continued. "Rips' results are wildly significant, beyond anything usually seen in science. I've read his material thoroughly, and the results are straightforward and clear." "Statistically it is far beyond what is normally required. The most stringent standard ever applied is 1 in a 1000. Rips' results are significant at least at the level of 1 in a 100,000. You just don't see results like that in ordinary scientific experiments." "It's very important to treat this like any other scientific experiment very cold, very methodical, you test it, and you look at the results. As far as I can see, the Bible code is simply a fact." "I'm talking as an accountant. I've checked the books, and it's Kosher," said Aumann. "It's not just Kosher, it's Glatt Kosher." Aumann had been skeptical. At first he could not believe that a code in the Bible revealed the future. "It goes contrary to all my training as a mathematician, and even the religious thinking I've come to be comfortable with," he said. "It's so different from anything known to science. There has been nothing like it in all the hundreds of years of modern science." Aumann talked to leading mathematicians in Israel, in the United States, all over the world. No one could find a flaw in the math. He followed Rips' work for years, and he continued to investigate it for months. Finally, on March 19, 1996, the most famous mathematician in Israel told the Israeli Academy of Science, "The Bible code is an established fact." THERE is still a great deal no one knows about the Bible code. Rips, who knows more than anyone, says it's like a giant jigsaw puzzle with thousands of pieces, and we only have a few hundred. "When the Bible code becomes widely known, and people try to use it to predict the future, they should know it's complicated," says Rips. "All probabilities may be there, and what we do may determine what actually happens. Maybe it was done this way to preserve free will. "The worst thing that could happen is that some people might interpret what they find in the Bible code as commandments, as telling them what to do-and it's not that, it is only information, and it may only be probabilities." But if all probabilities are in the Bible code, it only raises the big question to a new level. How can each moment in human history be encoded? In the broad sweep of history, even the Rabin assassination and the Moon landing and Watergate are all just moments. How can they all be encoded in one book? I asked Rips if there was any limit to the information that was in the code, how much of our history was hidden in the Bible. "Everything," said the mathematician. He quoted again the statement he had read to me when we first met, the words of the eighteenth-century sage, the Genius of Vilna: "All that was, is, and will be unto the end of time is included in the Torah." How could that be possible, the original text of the Old Testament was only 304,805 letters long? "Theoretically there is no limit to the amount of information that could be encoded," said Rips. He took my legal pad and started writing down an equation. "If we have a finite set, we can look for the power set, and the set of all its subsets," he said. "And each element of each set can be on and off." On the notepad he had written down a formula: S, P(S), P(P(S)) _ P2(S) .... PK(S). I couldn't understand the math, but I got the point. Even with a limited data base, there could be an endless number of combinations and permutations. "At least 10 or 20 billion," said Rips. He explained the meaning of that number: "If you start counting from 1 and never stop day or night, it will take you 100 years to count up to 3 billion." In other words, the Bible code contains more information than we could even count, let alone find, in several lifetimes. And that doesn't take into account the "crossword puzzles" created when 2 or 3 or 10 different words are linked together. In the end, says Rips, the amount of information is incalculable, and probably infinite. And that is only the first, crudest level of the Bible code. WE have always thought of the Bible as a book. We now know that was only its first incarnation. It is also a computer program. Not merely a book that Rips typed into a computer, but something that its original author actually designed to be interactive and ever-changing. The Bible code may be a timed series of revelations, each designed for the technology of its age. It may be some form of information we cannot yet fully imagine, something that would be as strange to us now as a computer would have been to desert nomads 3000 years ago. at two-dimensional arrays, and we probably should be looking in at least three dimensions, but we don't know how to." And no one can explain how the code was created. Every scientist, every mathematician and physicist who understands the code, agrees that not even the fastest super-computers we have today-not all the Crays in the war room of the Pentagon, or all of the main-frames at IBM, not all of the computers now in the world working together-could have encoded the Bible in the way it was done 3000 years ago. "I can't even imagine how it would be done, how anyone could have done it," says Rips. "It is a mind beyond our imagination." The computer program that reveals the Bible code is almost certainly not the last form the Bible will take. Its next incarnation probably already exists, waiting for us to invent the machine that will reveal it. "But even what we do know how to find, we can probably never finish decoding," says Rips. "Even on that level, the information is probably infinite." No one yet knows if each of us, and all of our past and all of our future, is in some still unknown higher-level code in the Bible, if it is in fact some Book of Life. But apparently every major figure, every major event in world history, can be found with the level of encoding we already do know. All of the leaders in World War II - "Roosevelt," "Churchill," "Stalin," "Hitler"-are there. "America" and "revolution" and 1776 ("5536") appear together. "Napoleon" is encoded with "France," but also with "Waterloo" and "Elba." The revolution that changed the 20th century, the communist "revolution" in "Russia," is encoded with the year it triumphed, 1917 ("5678"). Great artists and writers, inventors and scientists from ancient to modern times are also encoded in the Bible. "Homer" is identified as the "Greek poet." "Shakespeare" is foretold in a single code sequence that spells out not only his name but his deeds: "Shakespeare"-"presented on stage" "Hamlet"-"Macbeth." "Beethoven" and "Johann Bach" are both encoded as "German composers," and "Mozart" is identified as a "composer" of "music." "Rembrandt" is encoded with "Dutch" and "painter." "Picasso" is called "the artist." Every major advance in modern technology appears to be recorded. The "Wright Brothers" are encoded with "airplane." "Edison" is encoded with both "electricity" and "light bulb." "Marconi" is encoded with "radio." The two scientists who defined the universe for the modern world, "Newton" and "Einstein," are both encoded in the Bible, each with his major discovery. "Newton," who explained the mechanics of our solar system, how the planets are held in place by the force of gravity, appears with "gravity." Even Newton's own search for a code in the Bible that would reveal the future is encoded in the Bible. "Bible code" also appears with "Newton." "Einstein" is encoded once. "They prophesied a brainy person" appears in the same place. The word "science," overlapped by the words "a new and excellent understanding," cross his name. And right above "Einstein" the hidden text states, "He overturned present reality." His "theory of relativity" is also encoded. In fact, the full understanding of the universe that eluded Einstein, the Unified Field Theory, may also have been encoded in the Bible 3000 years ago. With his name, the one time it appears, and again with the theory of relativity, the code gives the same clue: "Add a fifth part." Apparently the answer that Einstein was seeking will be found not in our three dimensions of space, or in his fourth dimension of time, but in the fifth dimension that all quantum physicists now agree exists. "The most ancient religious texts," noted Rips, "also state that there is a fifth dimension. They call it `a depth of good and a depth of evil.'" Heaven and Hell? It's the kind of question that once preoccupied the world, but that few scientists, and fewer reporters, take seriously anymore. But the Bible code forces us to ask the biggest questions. DOES it prove there is a God? For Eli Rips, the answer is yes. "The Bible code is firm scientific proof," the mathematician states. But Rips believed in God before he found the evidence. Many others will also say that we now have the first secular evidence of His existence. I am persuaded only that no human could have encoded the Bible in this way. We do have the first scientific proof that some intelligence outside our own does exist, or at least did exist at the time the Bible was written. I do not know if it is God. I only know that no human being could have encoded the Bible 3000 years ago, and accurately foretold the future. If the Rabin assassination, and the Gulf War, and the collision of a comet with Jupiter are all encoded, and they clearly are, then some intelligence very different from our own did it. The Bible code demands that we accept what the Bible itself can only ask us to believe-that we are not alone. But the code does not exist simply to announce the existence of the encoder. The Bible was encoded to sound a warning.